UNWRAPPED: Seen here from the roof of Gibson Hall, the Walker Art Building will open to the public in October. Seniors will still be able to walk across the steps during Commencement. Although members of the Class of 2007 will walk across the completed steps of the art museum at Commencement, they will not see art back on the walls until their first Homecoming Weekend as alumni. The Walker Art Building, slated for completion on May 18, will officially open to the public on October 12, said Senior Vice President for Finance and Administration and Treasurer Katy Longley. "The construction will be completed in the spring but we'll have our official opening in the fall because we have a lot of valuable art that we'll be moving in," Longley said. "We decided not to open without art on the walls." The purpose of the $20.8 million renovation, which began in the summer of 2005, was to increase gallery and storage space from seven to 14 galleries, enhance handicapped accessibility throughout the building, and install a new climate control system. "There had been no climate control at all and that's just not acceptable with a state-of-the-art collection," Director of the Museum of Art Katy Kline said. According to Kline and Longley, the renovation architects strove to preserve the historic 1894 structure while addressing the modern difficulties that the space had encountered. The original architect, Charles Follen McKim, "got it absolutely right, the dignity with which it sits. It just hadn't grown the way it needed to grow," Kline said, noting that the renovated museum includes a large classroom space that will allow students from all departments to examine original artifacts firsthand. "I believe passionately in learning from the actual object," Kline said. "In the pre-renovation museum, getting the works from four different storage areas to the classroom took a very long time. But now, we have a state-of-the-art storage area and this incredible classroom right across from the elevator." The renovated museum also boasts a new holding room, in which new pieces can transition into the controlled climate of the museum. "Before, when art came in, we had to close the gallery for 24 hours," she said. Although most students will never set foot in the storage area, Kline said that the new storage space is also very impressive. "When we bring museum people here, they start to weep," she joked. 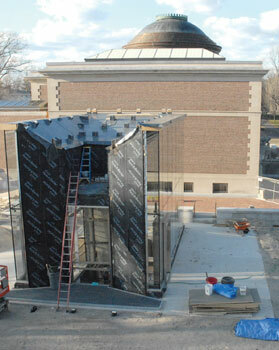 When the Walker Art Building opens in October, visitors will enter through a newly constructed glass pavilion to the left of the museum. Once inside the pavilion, guests will either use an elevator or walk down a flight of stairs to arrive at the entranceway and gift shop. Before the renovation, the gift shop was located in the rotunda, a space originally intended to house sculpture. With the gift shop relocated to the basement, the rotunda will be returned to a sculpture hall, Kline said. Although the reopened building will focus on the museum's permanent collection, a number of temporary exhibits will be an important part of the opening events, including an exhibition of modern and contemporary art on loan by six alumni contributors. "This is an area where the museum needs to be stronger in its own holdings," Kline said. President Barry Mills said that he is "really delighted" with the progress of the museum. "The fact that we are going to be able to do the [Museum Pieces dance show] tomorrow is exciting," Mills said. "I think when you have a project like the museum that sits in the middle of the Quad, people are eager to have the Quad back. I think people are eager for there to be peace and tranquility on the Quad again," he said.